Total search results: 1462. 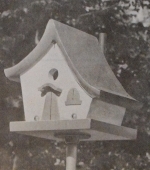 Displaying Page 1 of your woodworking search of BIRDHOUSE. 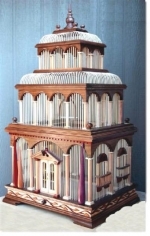 This Martin Palace is designed to house 1 birds and is easily disassembled for cleaning. It should be plaaced on a 4 x 4 post from 15 to 20 feet high. This is a vintage woodworking plan. Visit our FAQ page for a full definition. View the Larger Image Slideshow to see the actual item you are buying. Nuthatch, Chickadee, Titmouse and Downy Woodpecker Houses. This house is taller than the preferred size because it narrows so much at the top and bottom and these are not really considered living area. There must be some leeway to allow variations in design. Resize to suit your needs. Beginner skill level. Robin or Phoebe Shed. Some birds prefer an open shed or platform rather than a closed house. 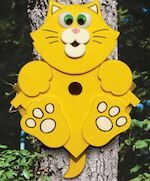 Or it can be used as a place to feed squirrels or other small animals near your home or on the trail. Resize to suit your needs. Beginner skill level. 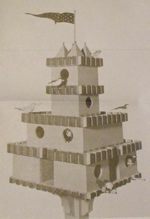 The plan says: Building bird houses can be lots of fun. They are easy to make and offer much in return. In song and the destruction of harmful insect you get repaid many times for the effort expended. The enclosed pattern really simplifies building this delightful bird house. No special tools or skill required. Complete material list printed on pattern. The plan says: This attractive slatted roof Wren House is an easy one to build. Just trace each piece of the full size enclosed pattern. 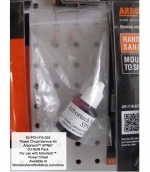 Saw and assemble exactly as the easy to follow, step by step instructions indicate. No special tools or skill required. You will have fun building these colorful houses and long enjoy the shelter they provide your feathered friends. 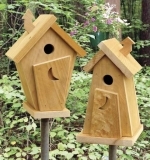 Outhouse Wren Houses Woodworking Plan. This pair of wren houses are designed after nostalgic outhouses! 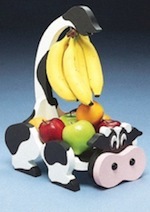 A fun and quirky addition to your yard or garden. Make out of inexpensive cedar fencing. All patterns drawn FULL size. 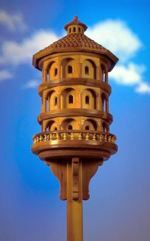 The plan says: It is easy to build this clever little wren house from this pattern, because each part is shown full-size, to trace onto scraps or box ends and then saw out. The pattern shows how to glue and nail the parts together, how to roof with tin from a can, and how to attach the floor with screws and screweyes to provide for opening hut to remove old nest.